By Bill Clendineng of Plainfield, Indiana, USA. I am a Quaker because when I was in high school I went to county-wide Youth For Christ meetings at Garden Grove Friends Church in Southern California. Fast-forwarding a few years, I found myself looking for a church to attend and while browsing through the phone book came across Garden Grove Friends. I was curious about what a “Friends Church” might be since I had grown up in various Baptist churches. I discovered something very different from what I had grown up with. The forms of worship in this programmed meeting were familiar, but the people I encountered there knew God in a way that was new to me. God was present. Jesus was teaching his people. So I stayed. As I discovered other things about Friends – our way of doing business, our understanding of ministry and the testimony of equality – I realized that I belonged among Friends. I am a Quaker who continues to be amazed at how the first generation of Friends broke through the forms and structures of the church of their day and discovered a way of living almost totally dependent on living in the presence of Jesus Christ. I am a Quaker in a programmed meeting who is quite comfortable and desirous of unprogrammed times of worship. I am a Quaker who is part of a stream of people extending back to biblical times who have experienced the revelation of God in many ways and forms. I am a Quaker who learns from George Fox, Margaret Fell, William Penn, Robert Barclay, John Woolman, Elias Hicks, Joseph John Gurney, Rufus Jones, Elton Trueblood and the many contemporary voices expressing Quaker faith. 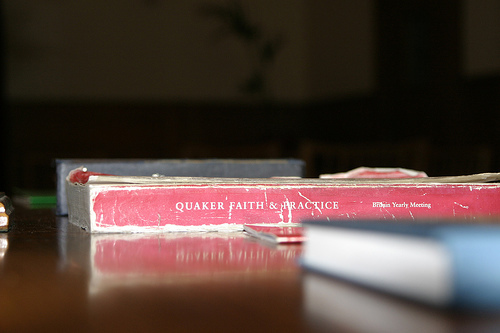 I see Quaker faith as an expression of Christian faith. I enjoy being part of the programmed tradition of Friends. Singing, group prayer and preaching are valuable elements of our worship. We are also comfortable with unstructured times of worship as we meet.